This article contains fast, fun facts and interesting information about the Otoe Native American Indians, also known as the Winnebago tribe or as part of the Missouri nation. Find answers to questions like where did the Otoe tribe live, what clothes did they wear and what food did they eat? Discover what happened to the Otoe tribe with facts about their wars and history. Summary and Definition: The Otoe tribe were originally farmers and once part of Sioux tribes of Great Lakes area, and commonly known as the Winnebago. With the introduction of the horse they traveled southwest to the regions surrounding south of the Missouri River and west of the Mississippi River in Missouri and Iowa. The were a strong, proud, war-like people finally settled near the Platte River in southeastern Nebraska. The above picture depicts an Otoe chief. 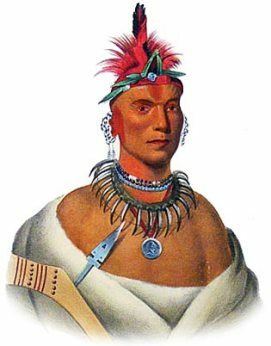 His regalia includes chocker necklaces made of beads and a striking bear claw necklace. He wears vermillion red face paint and wore a highly ornate headband with a roach headdress, that was topped with an eagle feather. He carries a lethal Gunstock club, which served as both a weapon and a status symbol. What was the lifestyle and culture of the Otoe tribe? The name "Otoe" means, "People of this Place". The Otoe people were closely related to the Omaha, Osage, Quapah and Ponca tribes and linked to the Missouri tribe. The state of "Nebraska" derives from an Otoe word meaning "flat water." The Otoe tribe were roving buffalo hunters who fought and hunted on horseback living in tepees during the summer and earth lodges in the winter. In 1854 the Otoe were forced to accept a reservation in Gage Country, Nebraska but were eventually sent to a reservation in Oklahoma. Following the Louisiana Purchase in 1803 the Lewis and Clark expedition with the Corps of Discovery made their famous journey. On 21 July, 1804 the explorers had reached the Platte River encountered an Otoe village of earth lodges. The Otoe, led by Chief Little Thief and Chief Big Horse, and the chiefs of the Missouria tribes, Chief Crow's Head and Chief Black Cat, were the first Native Indians that Lewis and Clark parleyed with in the West. Where did the Otoe tribe live? The Otoe are people of the Great Plains Native American cultural group. The geography of the region in which they lived dictated the lifestyle and culture of the Otoe tribe. What did the Otoe tribe live in? The Otoe tribe lived in Earthen houses, also called earth lodges, which was a permanent type of home for Native Indians who lived in harsh climates without large forests. The Otoe tribe also used tepees as a form of temporary shelter when they went on buffalo hunts during the summer months. What language did the Otoe tribe speak? The Otoe tribe spoke in the Chiwere dialect of the Siouan language, closely related linguistically to the Iowa and Missouri tribes. What food did the Otoe tribe eat? The mainstay of the food that the Otoe tribe ate was fish and buffalo, that was acquired on their seasonal hunting trips. The meats also included deer (venison), elk, bear and wild turkey. Their main food were supplemented with roots and wild vegetables such as spinach, prairie turnips and potatoes together with berries and fruits such as melon. When food was scarce the Otoe tribe ate dried buffalo meat, called pemmican. What weapons did the Otoe use? The weapons used by the Otoe tribe included bows and arrows, stone ball clubs, gunstock clubs, hatchet axes, spears, lances and knives. Painted war shields were used on horseback as a means of defence. Their traditional enemies were the Sioux, Fox, Sauk and the Pawnee. Their closest allies were the Missouria, Ponca and the Omaha tribes. What clothes did the Otoe tribe wear? The men of the tribe wore a variety of clothes including a red or blue belted breechcloth, and deerskin leggings, and sometimes a blanket robe over the upper part of the body, occasionally trimmed with fur. Buffalo hides were also worn as cloaks and moccasins were worn during the winter. The men of the Otoe tribe wore headbands and roach headdresses that were attached to a scalp-lock on their shaved heads and stood straight up from the head like a crest. Ornaments were made of beads, shells and metal. The women wore buckskin knee-length dresses or skirts, leggings and blanket wraps. Otoe History: What happened to the Otoe tribe? The following Otoe history timeline details facts, dates and famous landmarks of the people. The Otoe timeline explains what happened to the people of their tribe.